When manufacturers face urgent production challenges, they can rely on Operational Group’s rapid and fully-managed engineering solutions. We provide expert mechanical and electrical engineering solutions for long-standing clients across a range of manufacturing industries. We specialise in process and equipment upgrades and optimisations, control and instrumentation projects and service and maintenance services. Clients in sectors such as print and packaging consistently choose Operational as their trusted engineering partners. One example, an international coatings manufacturer which provides large-scale foil, lamination and holographic printing services to its customers was in need of some help recently. 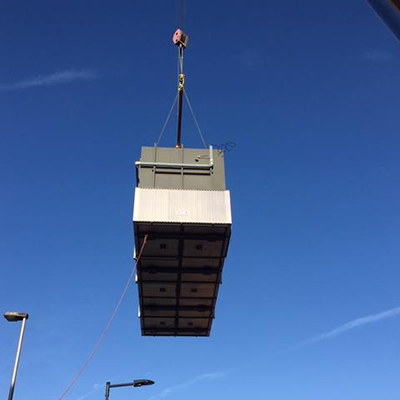 Through our long-standing relationship with the client in the UK, we received an urgent order to dismantle and relocate a three-canister regenerative thermal oxidiser (RTO) system with a capacity of 30,000 Nm3/hr capacity and ancillaries at a plant in Amsterdam. Operational engineer Dave Barker supervised the Amsterdam project and said: “We were able to pool our resources and respond to the situation immediately. We managed the complete project from start to finish, including road closures around the print plant and transportation of the RTO and other components to the new location. In addition to RTOs, we work on other industrial abatement equipment and processes including carbon beds, catalytic oxidisers, recuperative oxidisers, distillation towers and zeolite wheels. These processes are used for different industries ranging from brick making, metal casting, automotive, paint and coatings manufacturing to water and utilities. For more details about our engineered solutions visit our Solutions page.